John B. Denton Chapter was named to honor the memory of John B Denton, preacher, lawyer, soldier. Born in Tennessee July 26, 1806, he later became a Methodist circuit rider and came to Texas in January, 1836. He was killed in Village Creek Indian Fight, May 24, 1841. 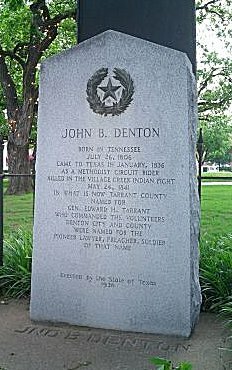 John B. Denton is buried on the Courthouse Square in Denton, Texas. The County of Denton, City of Denton, and John B. Denton Normal College were named for him. Although the Chapter was organized in Sanger, TX, current members are from Denton, Montague, and Wise Counties. Monthly meetings are held in Decatur.